I don’t know about you, but I’m glad the holidays are over. Back to the real world! 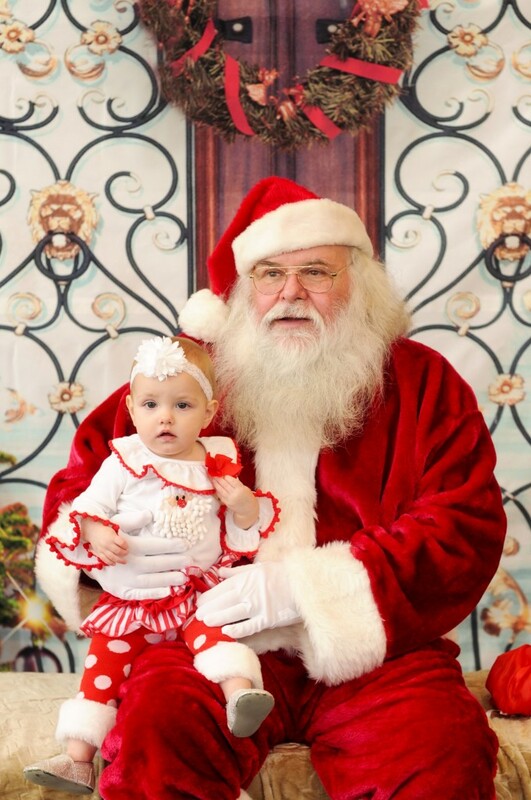 We had a wonderful Christmas, but I’m ready to get a good, solid schedule back in order. With all the festivities, I hadn’t had a chance to post these delicious monster cookies yet. My sister made them for a party she went to, and then my mom made some because they were that good! Harper and I both loved them as well. 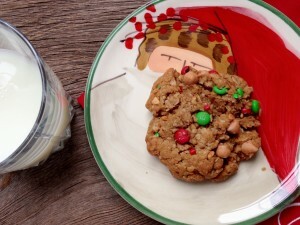 I’ve blogged monster cookies before, but ended up deleting them from the blog because they are not even in the same ballpark as this monster cookie recipe. 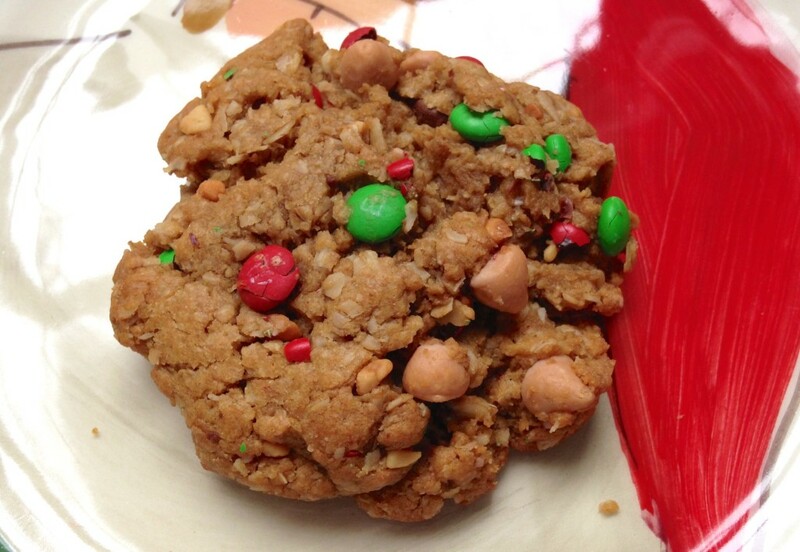 Almost 5 cups of rolled oats, peanut butter, mini M&M’s, chocolate chips, butterscotch chips, what’s not to like? They are loaded with so much good stuff, there’s only 1/2 cup of flour in the whole recipe!! Now that Christmas is over, instead of red and green M&M’s, you could use pink and red for Valentine’s Day, pastels for Easter, red, white and blue for the 4th of July… you get the idea. 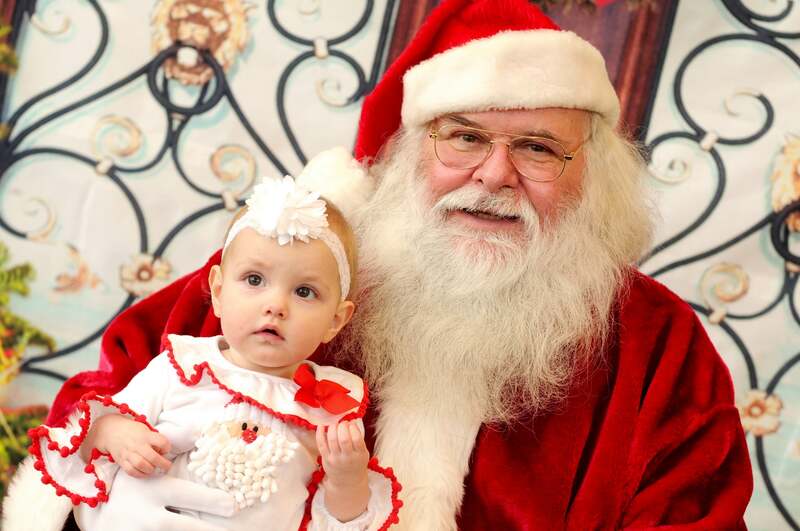 Harper met Santa for the first time. The picture doesn’t do it justice because she was actually smiling! Not a single tear for this brave girl! Preheat oven to 350 degrees F. Lightly grease (or line with parchment) two baking sheets. In a large mixing bowl, combine the eggs, sugars, vanilla, corn syrup, baking soda, and salt. 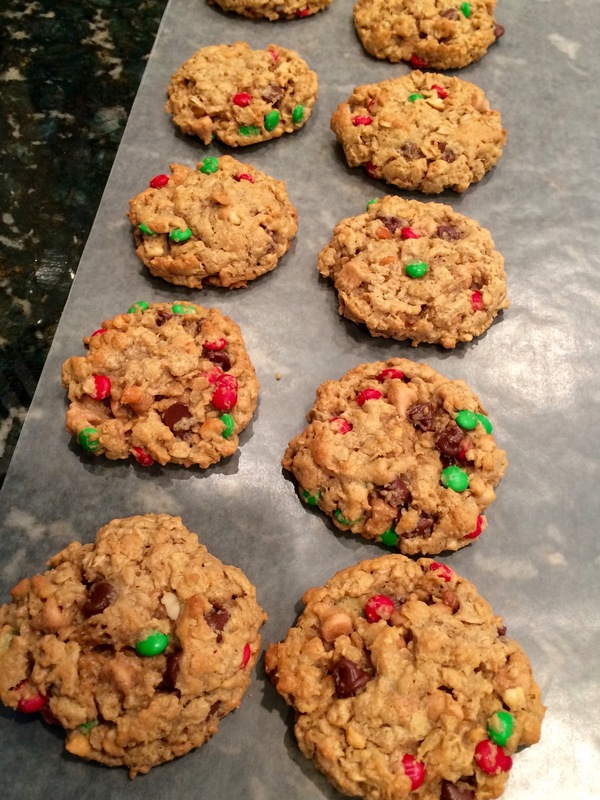 Stir in the melted butter, then the peanut butter, oats, and flour, mixing until thoroughly combined. Stir in the chips and M&M's. Let the dough rest for 30 minutes so the oats can absorb some of the butter. Drop the dough by ¼-cupfuls onto prepared baking sheets. Use your fingers to flatten the cookies slightly then bake them for 12 minutes, until they're a light golden brown. Remove them from the oven and cool on a rack. *Use mini M&M's. If you can't find mini M&M's, substitute ¾ cup (4½ oz) regular M&M's.